Characterful gite of the 17th century in the purest tradition of the country with panoramic view on the mountains of the Cantal, at 630m altitude in calm and nature. 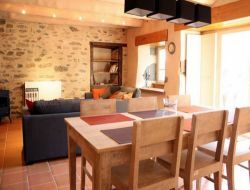 Gîte located between two lakes Enchanet and St Etienne Cantalès, with independent ground of 800m ² and terrace. Stones and exposed beams, large fireplace. For your holidays in Cantal (Auvergne), rent of a renewed house, adjoining to another holiday cottage. Living room, dining room, kitchen, 3 bedrooms, heating fuel oil and electrique, fireplace, tv flat screen, DVD player. Terrace. Privative garden in common enclosure with two other holiday cottages. 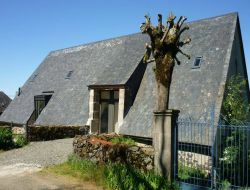 Barn converted into three apartments and a common room, in a quiet hamlet of the Auvergne, 5 km from the mountains of Cantal (country of Salers). An apartment with six beds (attic), terrace (breathtaking views). Two apartment with four beds, terraces. Bedding and linen provided. Private parking. Possibility of outdoor swimming in Mauriac (16 km). Washing machine common to the apartments. 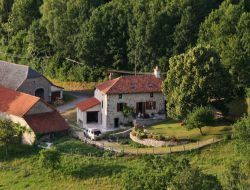 Holiday cottage for 4-6 people, situated in a former completely renovated farmhouse (2010), at the heart of the gorges de la Truyère, in the village of La Barge, on the site of the castle of Alleuze, close to the viaduct of Garabit. Holiday home with wood stove, car park, not enclosed ground, court and garden, garden furniture, parasol and barbecue. Possibility of rent of linen. Holiday home classified 2 stars, located 6km from Mauriac in the Cantal, between forest and meadow. Holiday rental for 6 people with 3 bedrooms among, terrace, ground, swing, toboggan barbecue, tv. Shops at 6km. 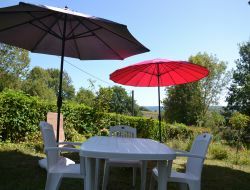 Gite located in a country house, on one level, with green area and views of the Cantal countryside. 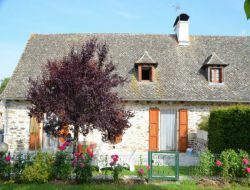 Our holiday cottage is an authentic farmhouse situated near a lake of the Cantal (Auvergne). Recently renovated, this holiday home which will offer you the charm of its origins and all the modern comfort. Holidays nature in Cantal: our holiday cottage Vallée d'Aspre welcomes you for a stay at the heart of the natural reserve of the volcanoes of Auvergne. Near Aurillac (28km) and Vic on Cère (9km), Saint Clément's city hall provides you with rural holiday cottages to spend holidays in the peace and in the middle of nowhere. Saint Clément situated in 1000m of height is a small village of Cantal, in the heart of the Park of the Volcanoes of Auvergne pleasant to discover all year round to practise outdoor activities there.